Ideal choice for your home, office or your indoor lighting needs. Made from Die Cast Aluminium with Powder Coated White finish. Reduce your carbon footprint and switch to bulb. Save on electricity bill and maintenance costs..
Actual product might vary from the image shown above. 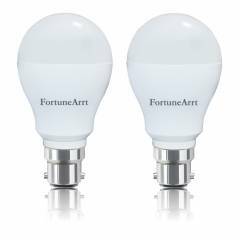 FortuneArrt 7W White B-22 LED Bulb(Pack of 2) is a premium quality LED Bulbs from FortuneArrt. Moglix is a well-known ecommerce platform for qualitative range of LED Bulbs. All FortuneArrt 7W White B-22 LED Bulb(Pack of 2) are manufactured by using quality assured material and advanced techniques, which make them up to the standard in this highly challenging field. The materials utilized to manufacture FortuneArrt 7W White B-22 LED Bulb(Pack of 2), are sourced from the most reliable and official LED Bulbs vendors, chosen after performing detailed market surveys. Thus, FortuneArrt products are widely acknowledged in the market for their high quality. We are dedicatedly involved in providing an excellent quality array of FortuneArrt LED Bulbs.